The energy division at Sunrise Cooperative offers a wide range of products and services including propane, heating oil, bulk diesel fuel, lubricants and gasoline. Serving everyone from homeowners to commercial fleet operations, the experts at Sunrise know how to deliver fuel in a safe and timely manner to meet your needs. We also offer a variety of contract options and payment plans to help keep your home and business running smoothly. With Sunrise propane, you can count on us to provide dependable service and a variety of contract options so you can rest assured your home will remain fueled all year long. Whether you want to lock in a propane price now or follow market pricing, one of our customer care representatives will work with you to find a propane program that meets your home and appliance needs. With our propane program, you can cap your maximum price at the beginning of your contract and you are guaranteed your price will not exceed that maximum, even when the market price soars. We are proud to have honored all of our contracts and capped prices during propane shortages and price spikes. Sunrise is proud to partner with CHS to offer the Cenex® line of top-quality lubricants and grease. Not only will proper lubrication and maintenance keep your equipment running smoothly, it will help improve your bottom line. Sunrise Cooperative offers a variety of bulk fuel options. 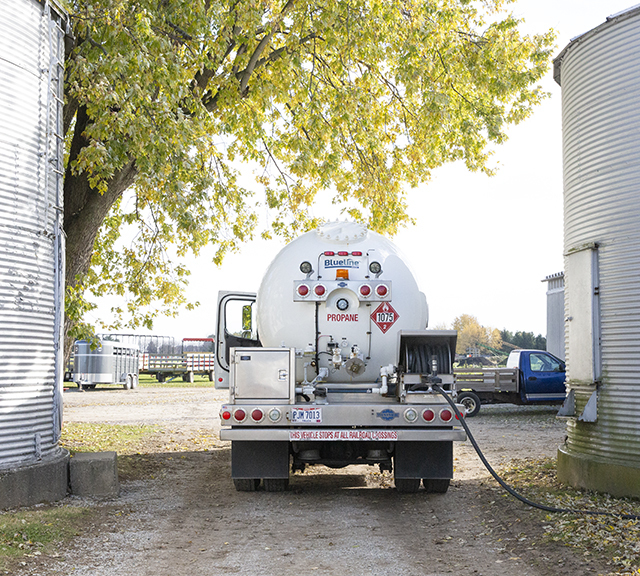 We give our customers delivery and contract choices on how and when they get their bulk fuel – whether gasoline, on-road or off-road diesel, or fuel oil. Apply for an account by filling out a credit applicaition. You may download and print a credit application from this website or we will send it to you by mail, fax, or email. Complete the credit application and return it to the address or fax number at the top. Our credit department will process your application and notify you by mail when completed. After you receive a determination letter from our credit department, please contact our service department to schedule the tank set and safety inspection. The phone number for our service department will be included in the above mentioned letter. After you receive a determination letter from our credit department, please call your local Energy office to schedule a delivery. We appreciate the opportunity to serve you with the quality products and service all customers deserve. We are a local company with dedicated and professional employees.